Earlier this year, Mediak vice president, Junnie Sublett, was working her booth at a fundraising show in San Diego. She was looking to pick up sales leads and generally network at the show. Then something unusual happened. "Are You Smarter Than A 5th Grader?" original cast members, Alana and Jacob, were making an event appearance when they wandered within earshot of Mediak's spiritual, educational, fun and original songs. The youngsters from FOX TV fame were evidently transfixed by what they heard. In particular, they fell in love with the positive themes and catchy melodies. Before long, they introduced their parents to the tunes. Then it struck Sublett that the kids would make superb spokespeople for Mediak. She brought up the idea to her husband, Mediak president, Charles Sublett, who agreed that it could be a synergetic relationship. Soon an agreement with the kids and their parents was in the offing. "It is important to their parents that the kids get involved with truly positive projects," said Junnie Sublett from Mediak LLC's headquarters in New Albany, IN. "They want them to be good examples for other kids, and they liked the idea of being connected to what we were doing. But it all started when the kids came over to my booth one day and said, 'Wow, what is this? This is cool!' They were in the aisle dancing." Having enthusiastic and well-known advocates of a brand is a time tested method of increasing sales, and the Subletts hit the jackpot. 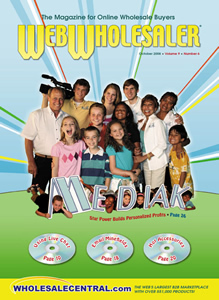 Alana and Jacob's personalities are perfect for Mediak's, "You Can Do Anything," DVD, which is the first effort by the company to marry its unique copyrighted songs with video production. "We instantly knew their experience and talent would be a perfect fit with the You Can Do Anything DVD," Junnie Sublett said. "To give you an idea of their roles, Alana and Jacob are like the co-hosts. Before every song, they give an introduction. There is one song, 'Lending A Hand,' about having responsibilities. In that case, Jacob explains that we all have chores to do and should lend a hand." The actors also playfully work throughout each song on the DVD, with movements that help illustrate the appropriate message or theme. But why else did this partnership make so much sense? There is strong peer value involved, as the end-users are children. When kids see Alana and Jacob promoting these songs, they are going to excitedly tap their moms, dads, uncles, and other relatives on the arm in stores and at mall kiosks, asking to buy them the You Can Do Anything DVD. Mediak's print-on-demand technology allows dealers to fulfill DVD and CD orders immediately for customers. "With the other companies, the DVDs take one to two weeks for having them mailed," Junnie Sublett said. The real winners are the network of dealers who sell Mediak's personalized musical products in their stores and online. Many dealers were already augmenting their regular sales with Mediak. The "Are You Smarter Than A 5th Grader?" stars are going to create even more excitement. "The kids love the product and are enthusiastic proponents," Charles Sublett explains. "I believe they will bring tremendous attention to the products in the stores via both the videos on flat screen monitors and printed marketing materials." The new DVD (price points to be announced) is only where the story begins at Mediak.com, where viewers of the website will find a balance of secular and Christian CDs. The Subletts have put together seven feature albums that have no specific religious message and seven feature albums that do. In total, they have 28 albums, which are designed to satisfy specific ages from infant to 11 years old. There are also four Spanish language features. Mediak takes enormous pride in the quality of the copyrighted recordings. Every album is produced and performed by professional musicians. For instance, the Spanish language features were made only after Charles Sublett personally visited Spain, Monterrey, Mexico, and other destinations in order to find the right voices and performers that were needed to make the features professional and powerful. With all of the products, the quality does not go unnoticed by the listener. "The songs are so gorgeous that people cannot help but be affected," Junnie Sublet said. "Our dealers see that all the time with their customers." A great thing about being a Mediak dealer is that the tunes can be personalized for the recipients right on the spot. If a father wants to bring home a batch of songs with his daughter's name incorporated in them, he can have it done within minutes. How does it happen? Retailers, mall kiosks and other kinds of brick-and-mortar dealers can purchase Mediak's affordable on demand CD burning and label printing machine. Since all of the music and names are stored in the compact unit, the only significant space the reseller needs is for blank CDs. The printed label for the CDs can be personalized by recipient name. Additionally, dealers can put their toll-free number and website on the labels, encouraging viral sales from family members who see the CDs. The burn-and-print systems themselves are made by Mediak. The systems let dealers burn up to three different CDs simultaneously in only three minutes, while the dealer pays Mediak on a per burn ratio. The dealer can buy just a handful or dozens of burns at a time. There is no minimum number that needs to be purchased. Mediak also offers an iFrame based system, which allows online dealers to sell personalized versions of the songs with just a few clicks. This direct-to-consumer styled offering is especially attractive to catalog businesses who thrive online and offline. "A dealer doing Internet sales can use our iFrame on a page in their website," Charles Sublett explained. "The iFrame allows the visitor to search for a child's name by entering it into a search field. A list then appears with all of the variations of the name they entered. They select the name from the list and a window opens that shows all of the dealer's available albums. It's a simple process." The system is cost effective for dealers. If they use the system and handle order fulfillment in-house, their cost will be between $2.50 and $5 per unit, depending on the type of CD purchased. The profit margin will depend on how efficient their fulfillment process is. On the other hand, if a dealer uses Mediak for delivery purposes, understandably the cost runs higher (between $5.50 and $10.50) depending on the exact product ordered and shipping details. Although, Charles Sublett said, the dealer will see a lucrative average of 60 percent profit margins when his firm services the fulfillment. Currently, he added, 275 dealers are using the system for online sales alone. When one looks at how easy the consumer experience is on the front end, it's no wonder that Mediak continues to pick up resellers. "When the visitor clicks on the album they would like to hear, a media player appears, allowing them to select any track within the album and listen to the actual selected name being used," Charles Sublett explained. "The visitor never leaves the dealer's website, but the music is streaming from our server." For orders being fulfilled by Mediak, shipment will be made within 24 hours normally, and within 48 hours during the busy holiday season. Mediak can handle order files in almost any form: electronic data interface (EDI), spreadsheets, email, etc. The Subletts also have a special website that dropshippers can access with their customer ID to enter their orders directly into the database. The orders download to the Mediak production department every 12 hours. The daily production of fulfillment orders are batched in bulk, transferred by UPS to the carrier's Columbus, Ohio sorting center, and then turned over to the post office. The shipments normally reach a customer on the West Coast in about seven days and the East Coast in about four days. Less than a half of one percent of the CDs are returned by the end-user, proving that Mediak's process is well-executed. That includes the CDs being fulfilled both online and offline. The CD burners are excellent machines when it comes to store and kiosk sales opportunities. "We never challenge consumers if they call and indicate their CD has an issue," Charles Sublett said. "We replace it immediately. We do not require them to return the CD they have a problem with; we simply replace it, no questions asked. Junnie and I want the experience of dealing with us, or a Mediak dealer, to be a good one. We do whatever is required to make a customer happy, though we rarely have to do much. The quality of the product speaks for itself to the people who buy it." Mediak's educational, spiritual and fun songs are an opportunity to create extra revenue with an online or offline store. The consumer marketplace for parents, uncles, aunts and grandparents is essentially unlimited. The personalized CD, "is a wonderful keepsake gift," Junnie Sublett said. "The print-on-demand machines can be set up anywhere. It will help bring in new customers who normally may not have come into the store. I had a lady tell me just the other day how she was attracting all kinds of new customers because of the songs." In other words, what happened with the "Are You Smarter Than A 5th Grader?," stars was anything but a fluke. Getting sold on the Mediak catalog of songs is as simple as giving them a listen.